I believe, without seeing the closet door ideas gallery on this page, you won’t have a chance to make your closet door tremendous. Doors are not an important element to decorate when compared with another main element of the room. But, if you focus on the detail of your designing project, you will probably realize the importance of decorating the closet door. In this page, we’d like to get you to understand about it and start considering remodeling your closet door to get a perfect looking room. 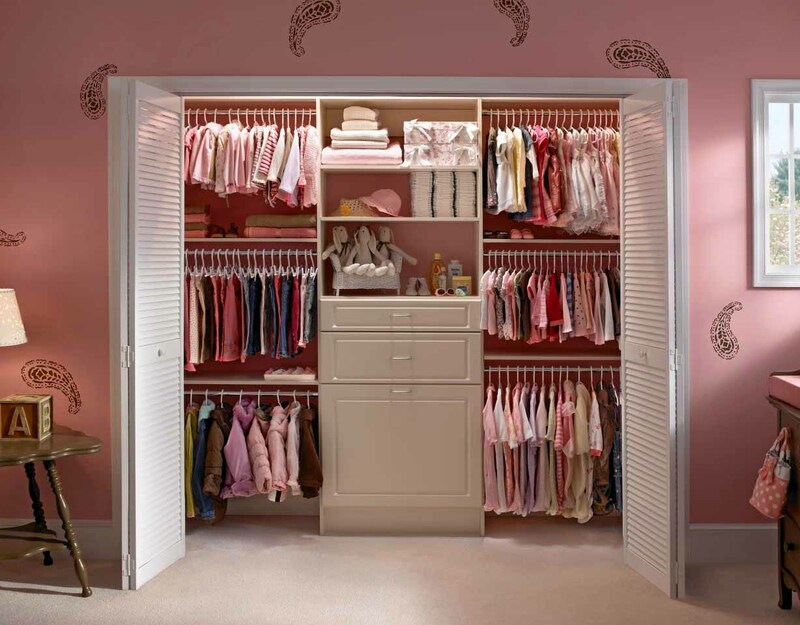 You will be provided with 20 ideas of the closet door to create some fashion before you get inside the closet. Don’t get it looks like the other door in the house, dress it well and make it stylish. Change the door with fabric. A curtain is an alternative type of a door. So, it would give you a unique display to your closet. Stick Wallpaper on the door. Why? It definitely makes dramatic changes and it would look superb. Paint the doors. Get the color matched with the theme of the room. Don’t just use one single color, do a combination. Add mirrors. 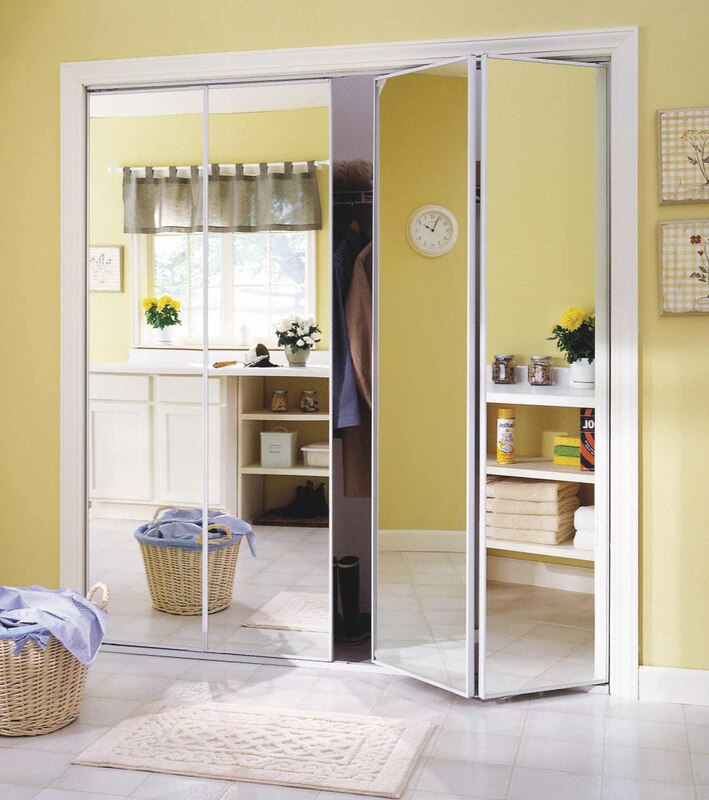 A mirrored door tends to be used in a small room. So, if you want to give the sense of space and light in your small bedroom. This way is where to go. Find compelling handle. The interesting handle can give its own charm to make the whole design of the door more appealing. With those 5 ways, you don’t have to be confused again about how to design your closet door. There are 20 closet door ideas that you can explore in this page. I believe some of them would attract your attention and get you very pleased to decide to remodel your closet door. If you want to go simple on your closet door, you may want to get to know this single door closet. This closet door idea is quite clever to save a space. It’s perfect for your smart or minimalist house. 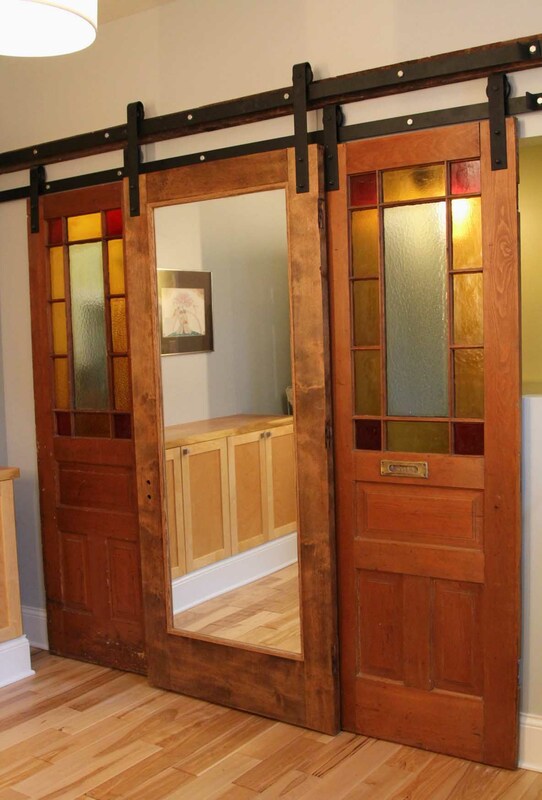 A modern barn door like this would give a spacious atmosphere around your room. That fact that it’s slid to open is looking staggering. If the clean design is not your style, probably you can go with rustic. 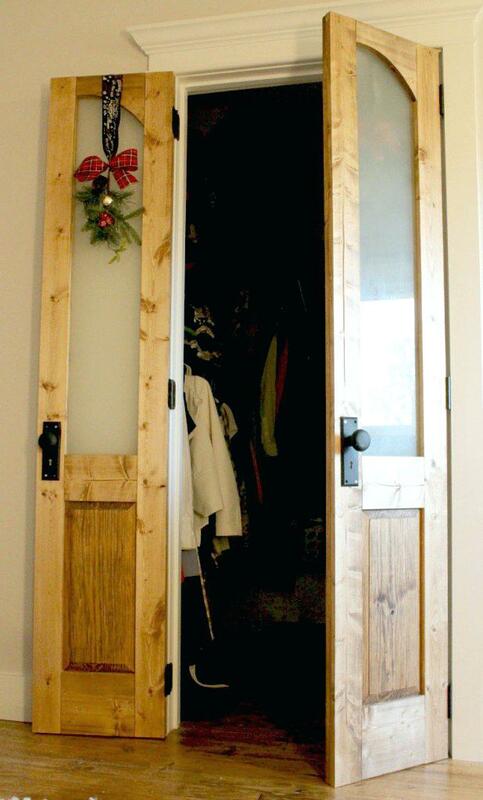 This closet door idea looks so rustic. It’s also opened by sliding. It’s a transformation of the bi-fold door that was separated and got put on a track to slide. The industrial and rustic taste of this old sliding door would turn your ordinary closet to be space that comes from another dimension. A French door design could also be a nice touch for your closed design in a bedroom. When dealing with French-themed elements, you knew that it would express the romantic feeling around the room. Why don’t you just go with it and see what happens? It could be the nicest addition for your bedroom atmosphere that would please your partner. A chalkboard paint is pretty common to be used in a room like a bedroom or a kitchen. In the kitchen, a chalkboard paint is used to be covered a little part of the wall to get some notes about cooking or a reminder. 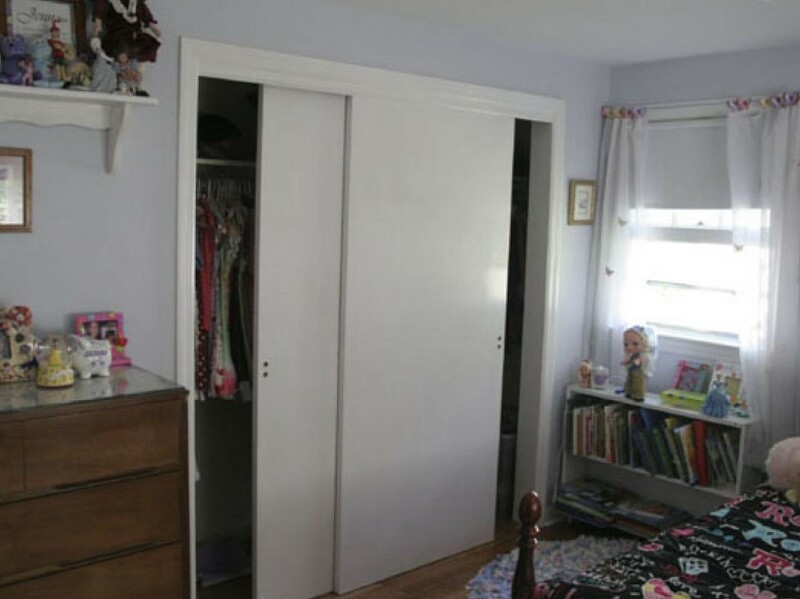 For a closet door in a bedroom, this paint is usually found inside children’s bedroom. 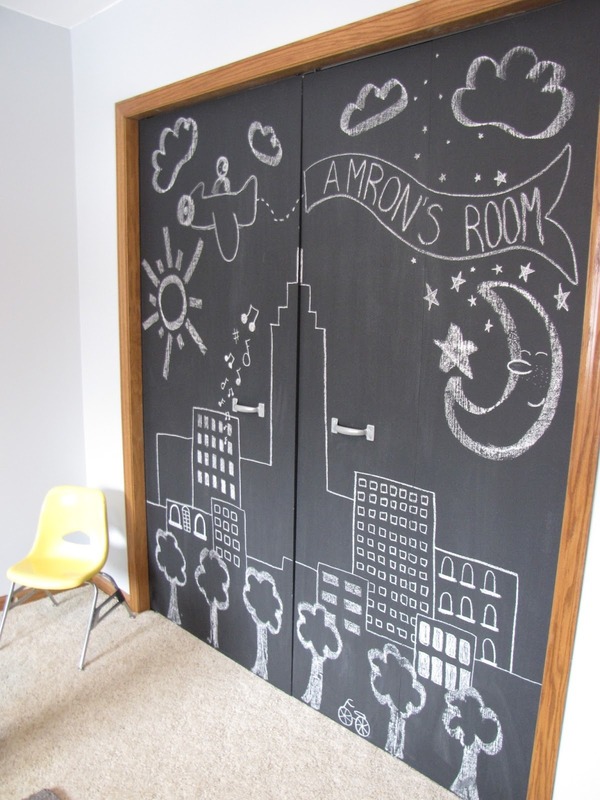 Applying chalkboard paint on their closet door, it would give them a fun canvas to create on. The style of European is pretty uncommon in the world of closet door design. There’s no such thing as boring when you have this impressive style in your room. The luxurious design of the handle and its surrounding making this closet door majestic. The crisp green color among other white sensation in this room is so attractive. This shiplap door is actually a reused door. 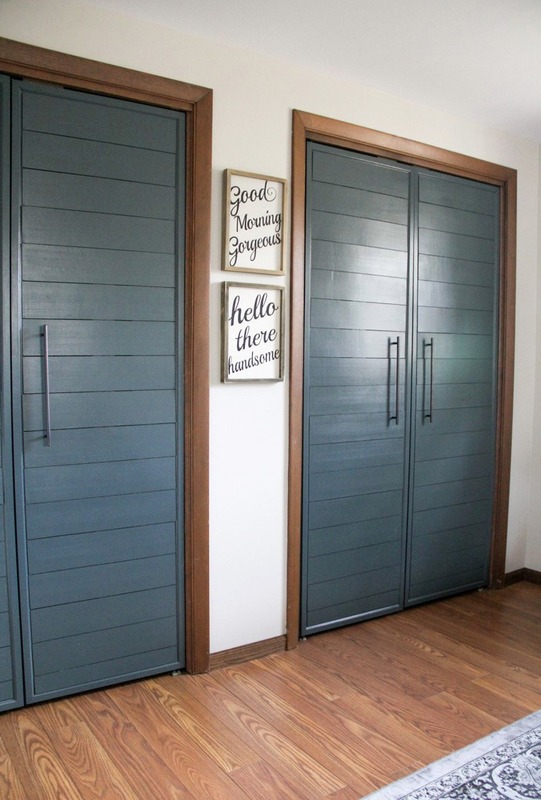 It’s a transformation of a bi-fold door that turned into faux shiplap french closet door. The remarkable dark color to balance the white wall. It’ll immediately steal your attention. In between the closet door, you can hang some framed quotes for decoration. I guess the minimal decor is there to get the door shine not to be over. 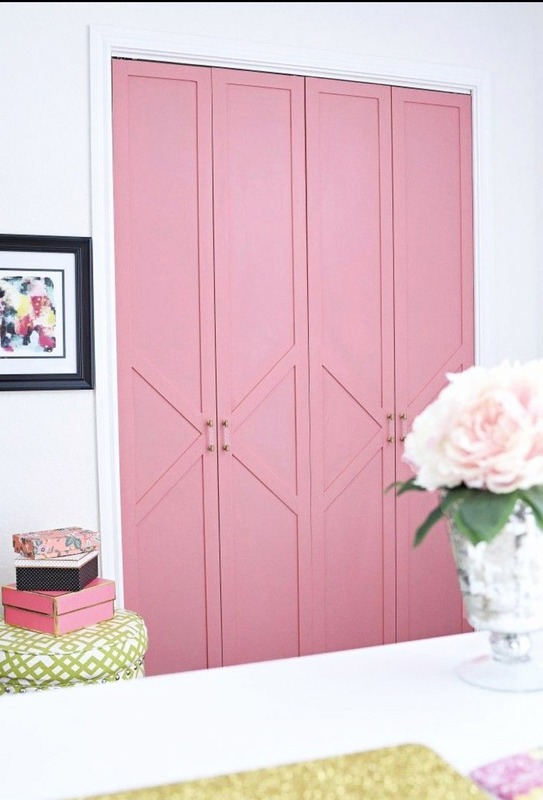 Choosing bold color pop to be painted on your closet door is a great option. The door of a closet can be your wall accent. As you can see in this photo, it uses soft pink for all doors’ area and crisp white for the rest of the area on the wall. It’s done just to make an interesting accent that produces by the closet door. Your closet door is not just an ordinary door anymore, it’s the center of attention. 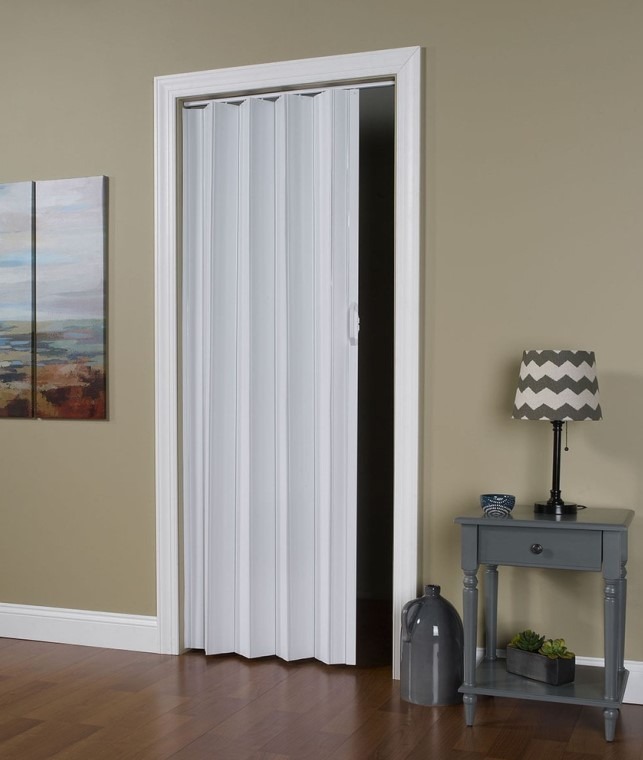 For a clean looking bedroom, this bypass closet door concept is an ideal choice. Take a look at that calm and clean bedroom. You won’t need a lot of things to decorate this bedroom, a few touches from the framed pictures and a plantation is enough. So, a simple and clean design of the bypass closet door is more than enough. As you can see, there’s no sliding steel displayed. Neat! This vinyl accordion door from Wayfair is something you don’t see every day in front of people’s closet. It’s a contemporary choice of closet door. At Wayfair, you will get this door made of lightweight PVC that looks like wood, fiberglass, and aluminum. When it’s shut, it would look nearly flat because of its narrow panels. This one is a concept that I already mentioned at the beginning of this article. 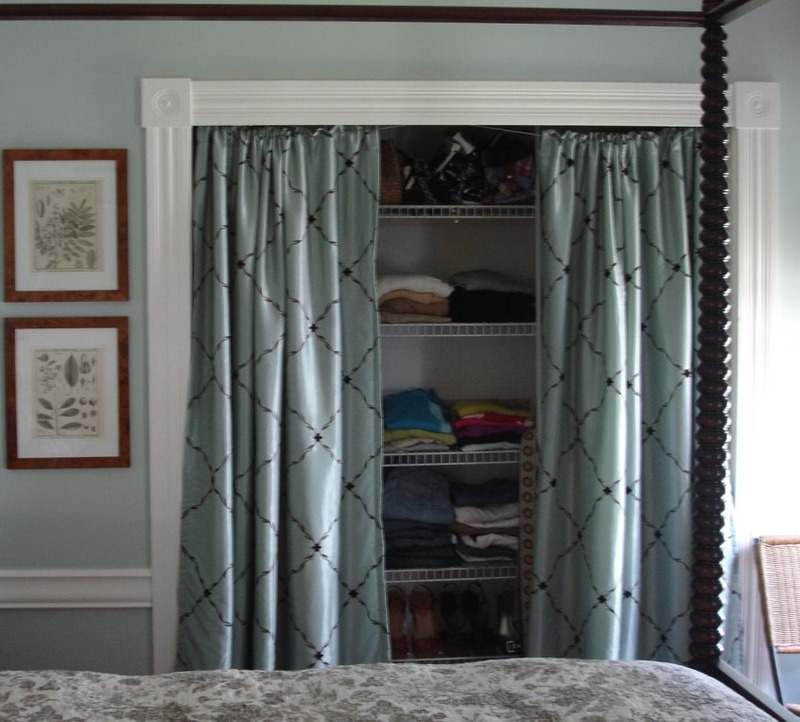 One of the effective ways to design closet door ideas is to use the curtain as an alternative. The key to being successful in choosing your closet curtain is to focus on making the bedroom more attractive. In this photo, the curtain is supported by the big chunky moldings to take it to perfection. If you want to combine your farmhouse style room with industrial charm, you may wanna take a look at this closed door idea a little bit closet. 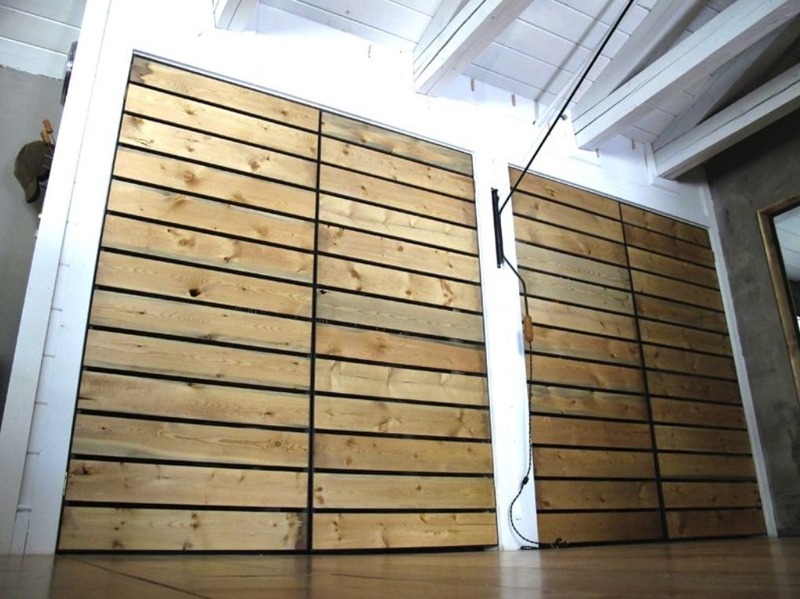 These steel-framed slatted closet doors look so industrial. It seems like the door you already you in your garage. In my opinion, the concept of the door design is not recommended to take place inside a bedroom. This idea is designed for you who look for an inexpensive closet doors makeover. The material itself is affordable. You are using an aluminum flashing roll that you can purchase with a cheap price from Home Depot. You can just cut it with scissors and stick them on the door of your closet. It would a nice reflection of the light. Giving your room a unique charm. A closet door with full-size mirror might be excessive but it’s actually looking glamorous in such a contemporary way. This kind of door would bounce more light around the room in order to get it to look inviting. There are other options for mirror design for your closet door, but this full-sized mirror is perfect for your small bedroom. The feeling of spacious will take control of the atmosphere. I recommend applying neutral paint when dealing with mirrored closet door design like this one. Having this big mirror as your closet would get you to to do the cleaning regularly. 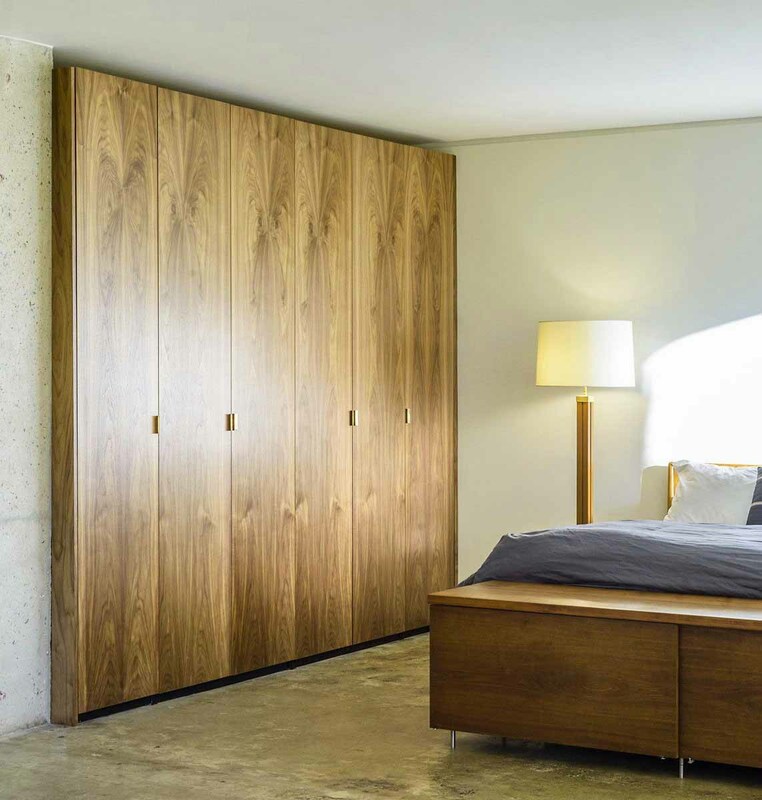 Most designers recommend having a sliding closet door to save some space in your room, especially a small bedroom. 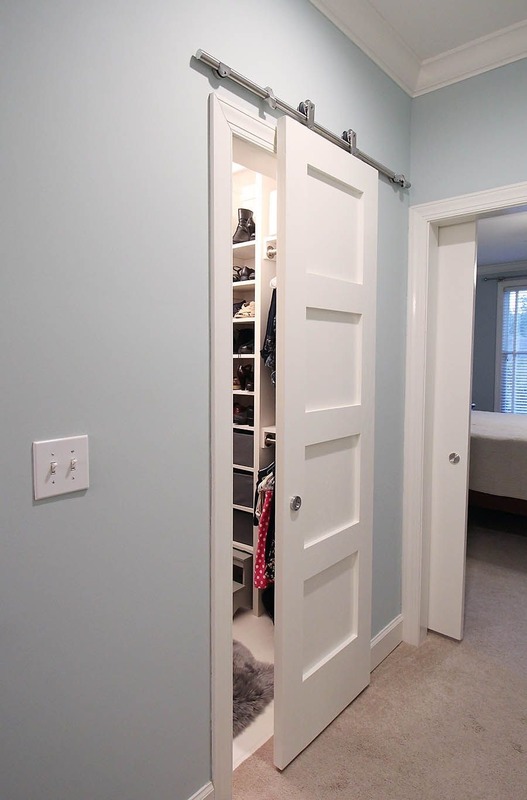 Some sliding closet door ideas are found in this page to support that recommendation. 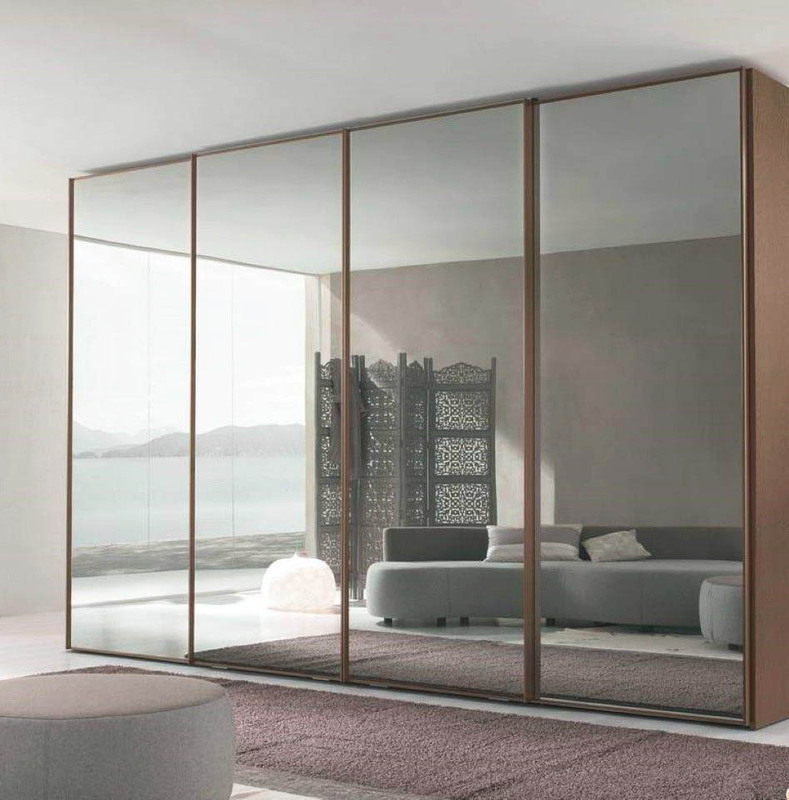 Take a look at this simple mirrored sliding door. It’s pretty basic which is perfect for your simple and minimalist style. 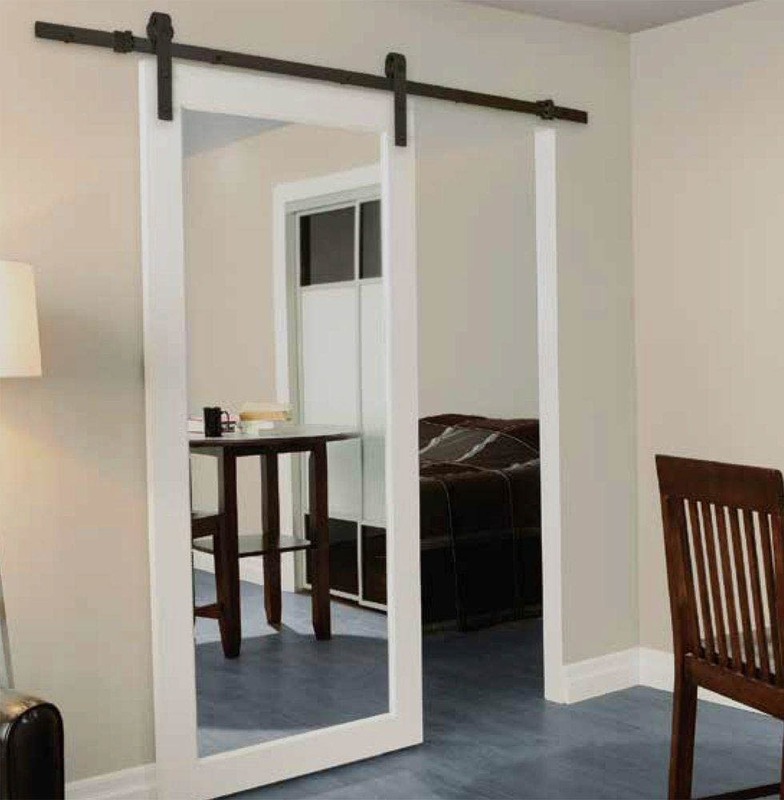 This closet door idea is a combination of a mirror and a bar slider that will make the door slide back and forth. It offers easy access and comfortable usage. It’s ideal to be installed in your room when you decide to combine rustic with modern design. That kind of combination is quite popular nowadays. It would make your closet door ideas trendy. For achieving a classic and majestic design, you can use an existing old large door frame to get it reclaimed and redesign it. Adding mirror on the frame would result in an astounding design of a closet door. It also offers excitement in terms of bringing classic style to the room. If you want something really unique for your closet door ideas, you should go with this one. As said before, the mirror could give a positive reflection on the atmosphere of the room. The space of the room would look bigger and the light would feel bright. The distressed wood frame on this sliding closet door is like combining 2 different styles, rustic and contemporary. Speaking about modern or contemporary, this closet door idea is simply modern. This the ideal choice for you who want to stick with the basic design of modern style. 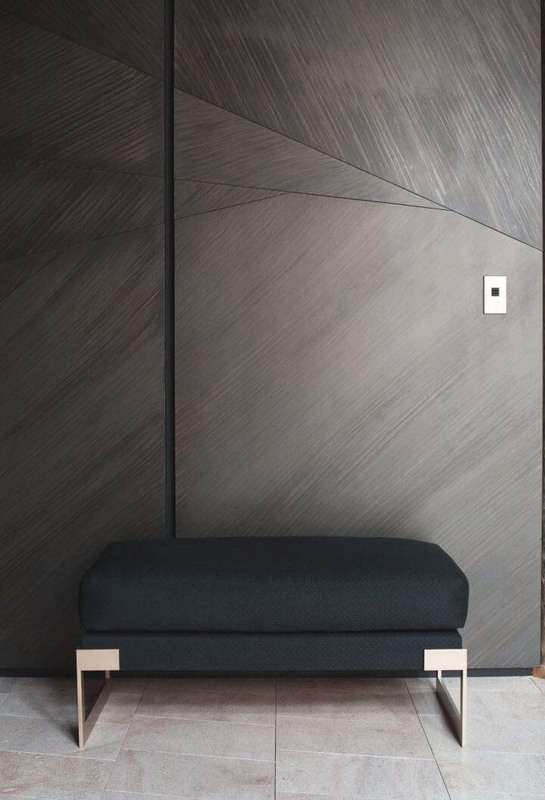 This classy design work with the texture that perfectly matches with the wall scheme. In addition, the couch in front of it is a fresh effort to blend the colors together. 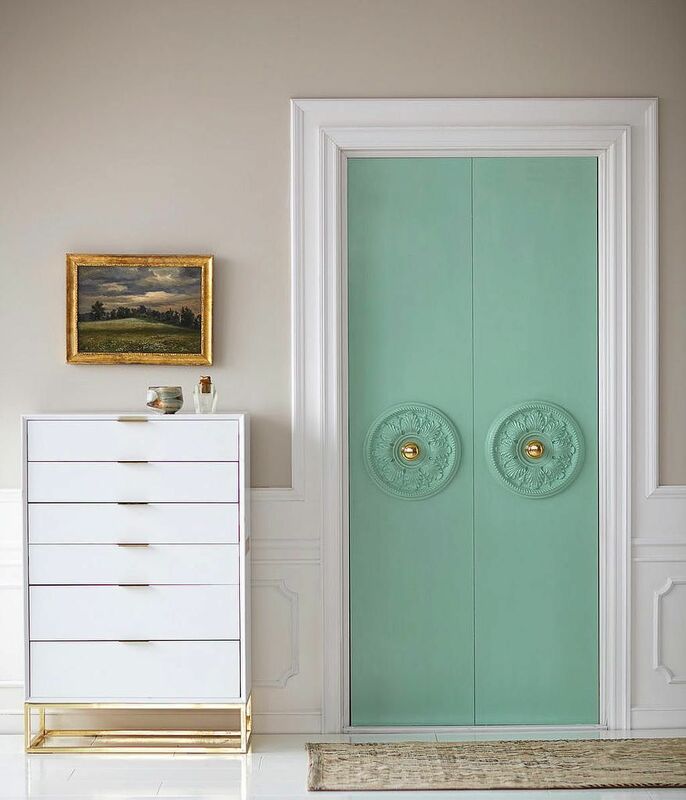 Just by looking at this closet door design, you would feel the glamorous effect that comes from the elegant texture of the door. It’s perfect for your exclusive bedroom. Even though the bench wasn’t supposed to be there but the door is still incredible. This is not the same as other mirrored closet door ideas, the bifold style of this door makes it very unique. It appears to have a full-size mirror on each part of the door. The way it opens brings its own charm into the atmosphere. It reflects almost everything around it, so it would be better not to have many things on the wall. You don’t need a lot of decoration, just let the wall simple and plain. 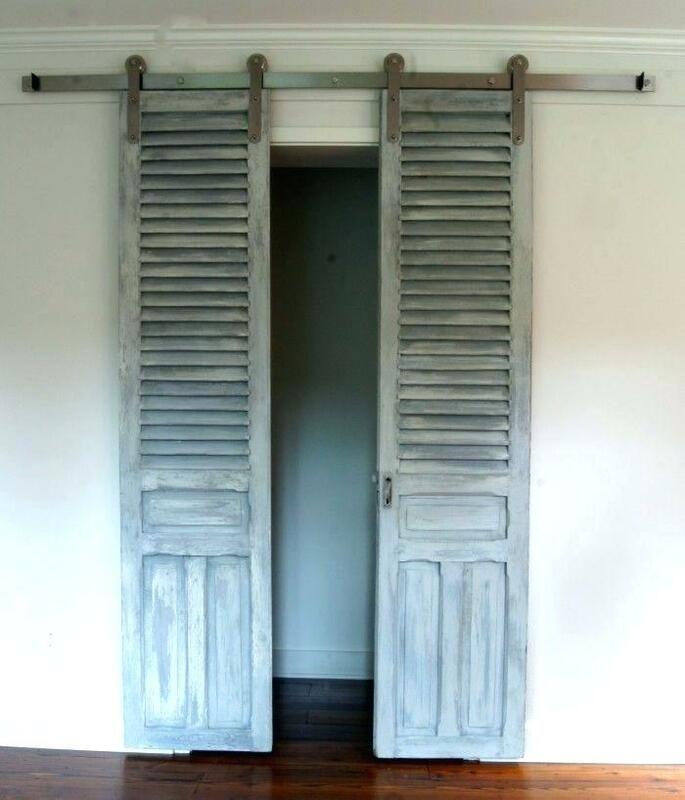 Many people called this as Louver closet door. The characteristic of this door is the slats. The slats in the door frame offer good circulation for your clothes inside the closet. So, you don’t have to worry about the air circulation when you shut the door. This functional door is one of the most used closet doors because of its amazing feature. Beside the air circulation, this Louver closer door is also a folding door. You can open and close the door by folding it. There will be enough space for you to walk around. You don’t need to have more space to open the closet door. The closet door of PAX is one of the most recommended product if you like to have a natural brown-wooden look for the interior. It features brown stained ash veneer that offers a nice look appearance for the bedroom. The closet door and wardrobe feature an anti-corrosive phosphate coating. That natural closet door matches with the wooden bed’s frame nearby. The impression of a natural element is improved because of that concrete pillar in the middle of the room. 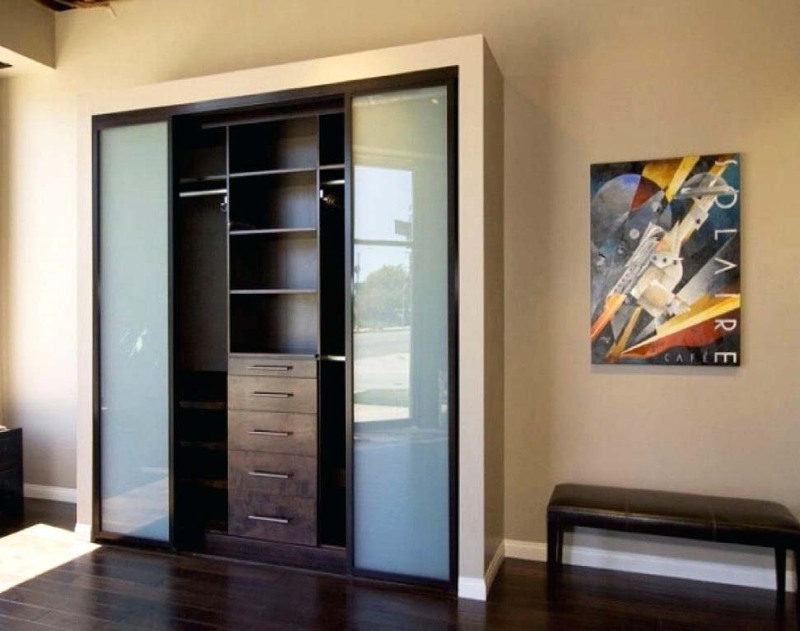 This frosted glass sliding closet door is a nice option to be added to your bedroom. 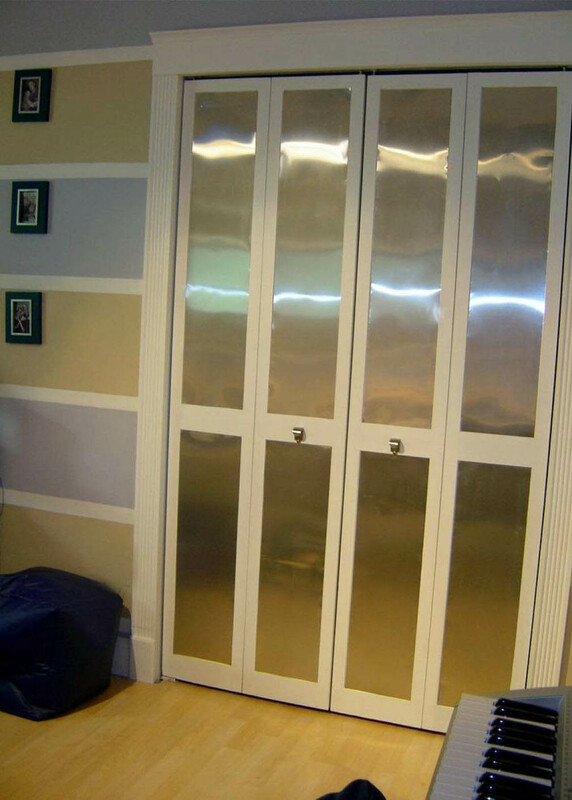 Besides being decorative, this frosted glass provides an efficient display of the closet from the outside. You have the ability to see through what’s inside the closet. The door would let your eyes to see your clothes inside in a blurred. After all those explorations, I believe you finally decide to go on remodeling your closet door to be more stylish than before. You will get fascinated with the result because all of the closet door ideas in this page are recommended by home design experts.